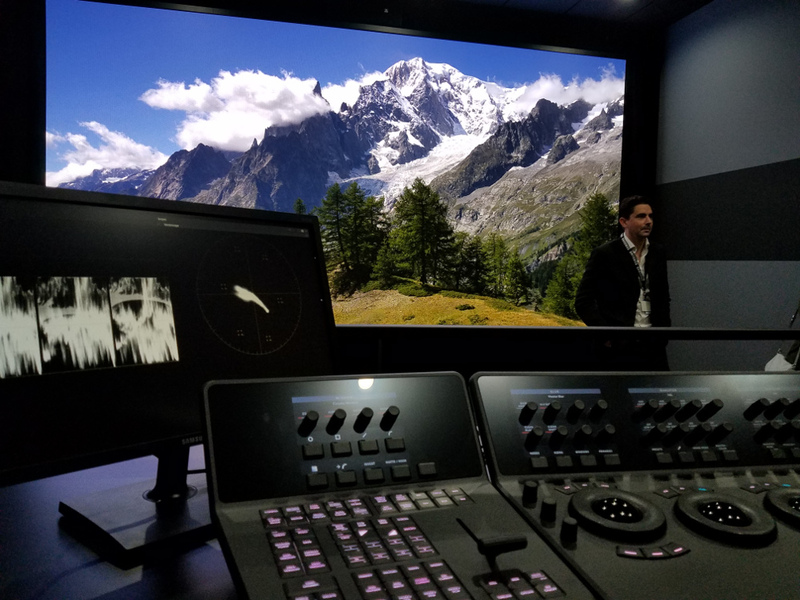 I had a chance to visit the first U.S.-based post production facility and commercial theaters in Los Angeles just prior to CinemaCon – both featuring Samsung’s LED technology. These are important milestones for Samsung and the visit highlighted the potential for the technology. It also highlighted the need to develop an HDR cinema solution acceptable to filmmakers, Hollywood studios and production facilities, exhibitors and manufacturers. The post production house is Roundabout with the new 2K LED screen located in its Santa Monica facility (they also have a much larger facility in Burbank). A select group of media representatives was first given a tour of the facility which houses a small grading suite in a theatrical setting that can seat up to 40 people and uses a DCI compliant Christie projector to view content. In process was a 4K remaster of the 1960 movie, ”The Apartment” starring Jack Lemmon and Shirley MacLaine. This is due to premiere at the Cannes film festival. The facility also has a smaller color grading room using a Sony X-300 grading monitor and a Sony X550 client monitor. A remaster of the Stephen King movie “Christine” was being worked on in that room. There were additional rooms for 7.1/5.1 audio mixing, a room for audio re-recording, edit suites and an additional room that will feature A Dolby Pulsar HDR monitor for 4000 cd/m² grading. Finally, we got to see the grading room with the LED screen. It fills the whole wall at 16.7 ft (5.1m) x 8.9 ft (2.9m) and is 2048 x 1080 in resolution. The pixel pitch is 2.5mm and it is configured to have a nominal peak luminance of 300 cd/m² (vs. the 48 cd/m² standard for SDR cinema). Content is delivered to the screen over an SDI dual link cable. The signal is 12-bits/color and content is encoded in PQ with a D-65 white point. The Roundabout installation can also support the EclairColor HDR solution as well and some content rendered in this format is likely to be shown at CinemaCon. The screen can also support a luminance of 500 cd/m², but this may change the viewer’s dark adaption state so that perception of colors is slightly changed. This could then require the use of a color appearance model to adjust the colors to maintain perception. 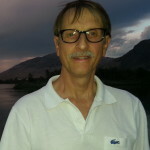 Colorist Brian McMann said that they want to now make the HDR cinema grade the “hero”grade with other versions then derived from this. He said his job is to make the images that come from a range of cameras all have the same “look” so skin tones and skies are consistent no matter which camera is being displayed. He then showed the incredible range of tools at their disposal to completely change the look and feel of the image. To prove this, he started with some shots of desert scenes and made one shot look like early morning, then he changed it to look like mid-day. 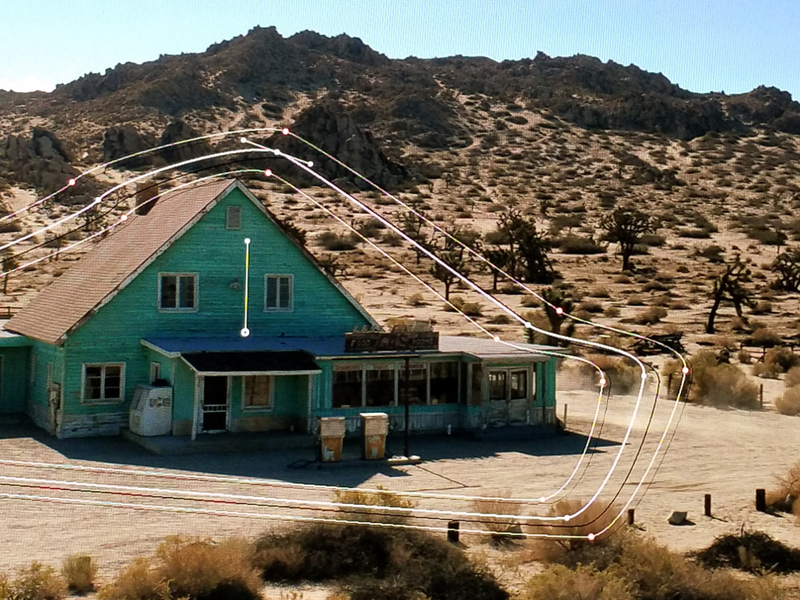 He quickly used his mouse to then pick some points around a gas station to create a window with a transition zone so he could work on the farm house separately from the rest of the scene. Want a blue gas station, no problem. Maybe red is better – that can be done. We were also shown some HDR footage captured with an Arri camera that was a collection of Arri employee’s faces and a few animals. This content looked stunning on the LED display and seemed very lifelike as the illumination source swiveled around the subject. This was recorded in Arri log and converted to PQ for the display. We wanted to see a gray scale or pluge pattern to see how well the screen was managing the darker tones, but we ran out of time. Privately, we were told the first step out of black is at 0.005 cd/m², so very black indeed. Maybe on our next visit we can physically confirm this. The overall impression of this HDR content was excellent. With very good control of the dark tones in a dark room, 300 cd/m² is not an unreasonable number to consider for the peak luminance level. This is one of the many issues that needs to be resolved to move toward an HDR cinema standard. We then moved to the new commercial theater in Chatsworth, California. 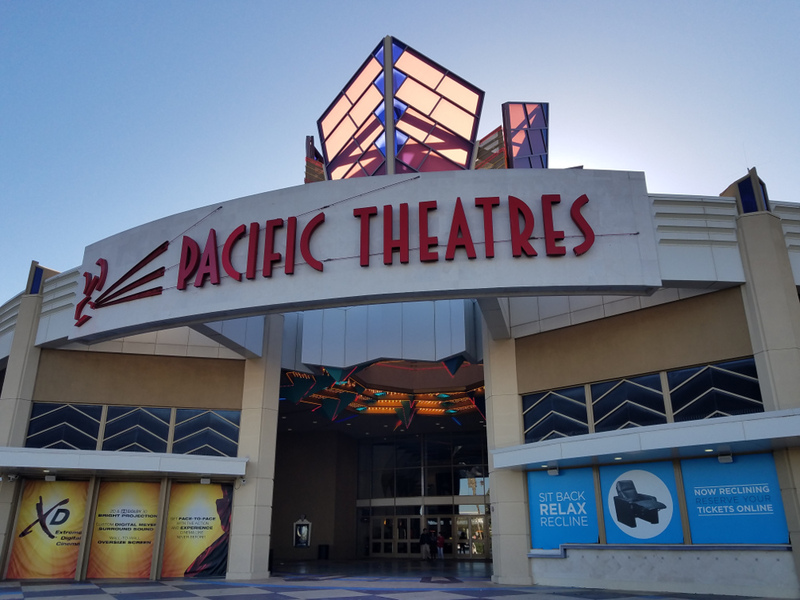 This is the Winnetka theater owned by Pacific Theaters. It is a multiplex that was refurbished recently and one of the theaters now has a 35’ (10.7m) wide 4K LED screen. Samsung has now decided to brand these screens as “Samsung Oynx” to symbolize how black they are. There was a ribbon cutting ceremony to open the theater and we became the first group to enjoy a movie in the cinema. But before seeing the movie, there were some additional presentations on the cinema screen and Samsung’s plans. As in Roundabout, the screen is set for 300 cd/m² but there is an advance setting that allows the peak luminance to rise to 500 cd/m². That would be very helpful for applications where there would be some ambient lighting, like dining or eSports activities. Power consumption depends on content, but the average power is specified at 3.7 KW – perhaps a little more than the lamp wattage needed for a similar sized screen. But, there are no fans and the LEDs are only slightly warmer than room temperature, so not being driven very hard at all. Harman executives also explained the audio design which requires that the center, left and right channels that are behind the screen in a projection-based cinema be moved to a position above the LED screen. On the walls in the theater, and at about the same height, were additional surround speakers. A subwoofer completed the 5.1/7.1 channel solution. Any standard 5.1/7.1 audio mix can play on this system without any modification. Harman explained that the first wall-mounted surround speakers include a special reflector horn and the wall-mounted speakers are all angled 15-degrees toward the LED screen. The purpose is to use the screen as a reflecting element with the goal of de-elevating the sound field. This is important so that as actors speak on the screen, the sound of their voice appears to come from their lips, not 10-15 feet (3-5m) above their lips. Unfortunately, I did not feel Harman achieved this last goal. I walked all around the theater to listen to the dialog. While Harman’s solution does seem to create a nice uniform sound field throughout the theater and dialog is crisp everywhere, my sense was that the elevation was still too high. 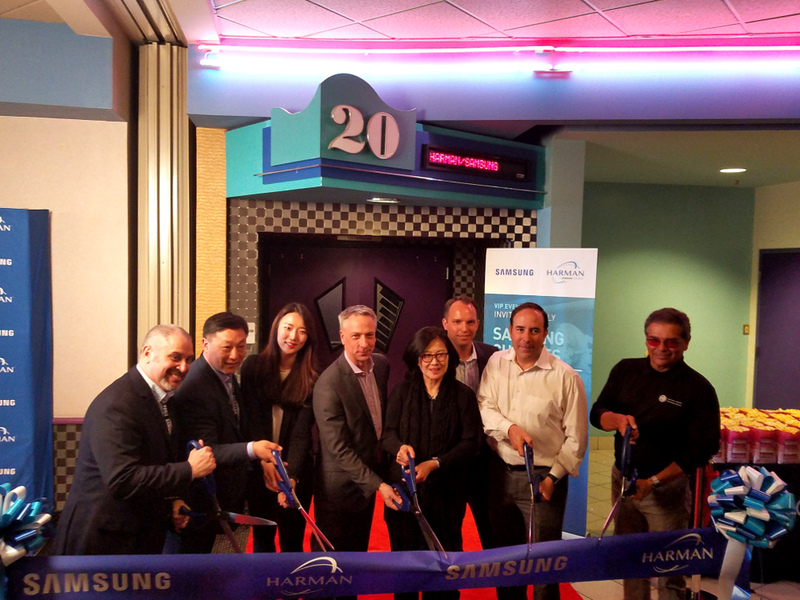 Samsung plans to make theater installations with trusted partners. For example, it owns a subsidiary called PrismView that provides the structure for the LED wall and speaker system that includes three catwalks in the back of the screen. GDC is providing the IMB (Integrated Media Block – which is basically a secure server) and optional active shutter 3D glasses (Samsung will demonstrate this at CinemaCon and showed 3D at ISE). Moving Images Technology (MIT) was the integrator for this theater. At CinemaCon, Samsung and Ymagis, the parent company of Eclair, plan to announce that the Ymagis installation company, CinemaNext, will now offer the option of installing a Samsung LED Onyx screen with the EclairColor HDR system intenrgated into the IMB. Theater owners that purchase their Onyx screen from another source will also have the option to add EclairColor HDR. To date, Ymagis has focused on adding EclairColorHDR to high contrast projectors from Sony. So far, 126 cinema auditoriums have been equipped with EclairColor, including 59 in Germany, 54 in France and three in the United Kingdom. Expect more news from Ymagis at CinemaCon. Samsung also revealed it plans to introduce a larger 4K LED Onyx screen in Q4’18. This will increase the pixel pitch from the current 2.5mm to 3.3mm resulting in the width increasing from 33.5’ (10.2m) to 45.9’ (14m). The pixel pitch needs to increase as there is no agreed upon way to perform scaling in DCI – even for SDR content. Lifetime for the screen is specified at 100K hours (unclear if that is to 50% or 70% of initial brightness), which they calculate means about 17 year of life for normal cinema usage. This is also calculated that the 300 cd/m² level for the entire time, which won’t be the case in prcatice. However, the LEDs will have to be driven harder as they age to maintain the 300 cd/m² peak. If one of the 6” x 6” (15cm x 15cm) LED modules is damaged, it can be easily removed and replaced. Each installation comes with two spare cabinets which each contain 24 modules. Samsung recommends that you vacuum the screen and recalibrate it every two years, which seems awfully long to me (it will have to be recalibrated if a module is replaced as well). As for price, Samsung dodged that question, but did note that for new construction, no projection booth is needed. This, plus a lower ceiling can save at least $25K in construction costs and may allow up to three extra rows of seats. 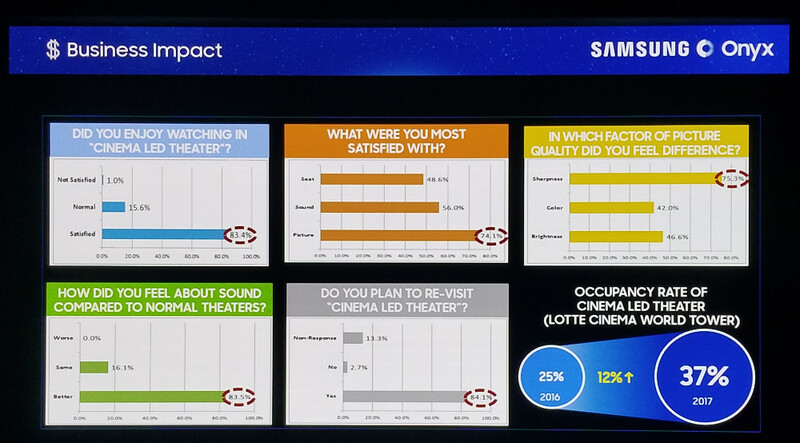 Finally, Samsung showed the results of some surveys they have done at their first LED screen install in Lotte Tower in Seoul, Korea. They highlighted the fact that the survey showed that 84% of respondents plan to revisit the LED cinema in the future and that the occupancy rate of the theater increased 12% from 25% to 37%. At last, we started to see some content. This consisted of two SDR trailers and an HDR piece from Amazon. There was no point in showing the SDR content and the Amazon HDR content was not very visually interesting at all. We finally got to see our movie – Ready Player One. This was on my see list and I very much liked the movie. But this movie only highlighted a big problem in the roll out of these LED cinema screens: there is no HDR first-run theatrical content because there is no standard to produce it. Any DCI-compliant content must be shown in SDR which means it is graded to a maximum of 48 cd/m². Non-DCI content can be shown in HDR if the content is HDR. An UltraHD Blu-ray mastered in HDR will look great on this screen, but the DCI version is likely to seen as inferior as it must be SDR. For example, the opening credit to the movie shows the lettering on a decidedly gray background – not the black background you would hope for from an LED screen. As a result, it was quickly evident that the DCP we were seeing had been mastered for a standard projector. Not only were the highlights crushed to meet the 48 cd/m² peak, but the blacks were lifted as well, reducing visibility of the dark tone. In other words, many of the technical benefits of the LED could not be used on DCI-compliant movie content. That’s a shame when seeing an LED scree is likely to be the main reason that people will want to go to this theater. Yes, the LED screen will offer better uniformity and sharpness over the entire screen, plus the ability to deliver full brightness all the time. These are clear benefits over a projected solutions, but they are not HDR features. Only standardization can address this issue. Should HDR Displays Follow the PQ Curve?